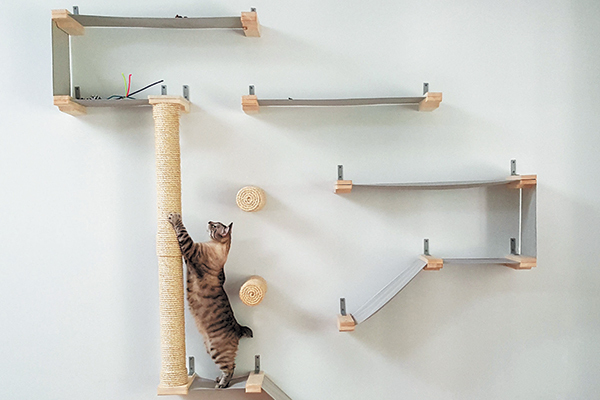 Whether you’re going DIY or purchasing, we’ve got some pointers on creating cat climbing systems that look great and keep your kitty happy. The best way to make your indoor cat feel at home is to give her a place to climb. And I’m here to tell you that if you don’t design it for her, she’ll just figure it out on her own — and you might not like her choices. There are different approaches to creating a cat climbing system in your home. 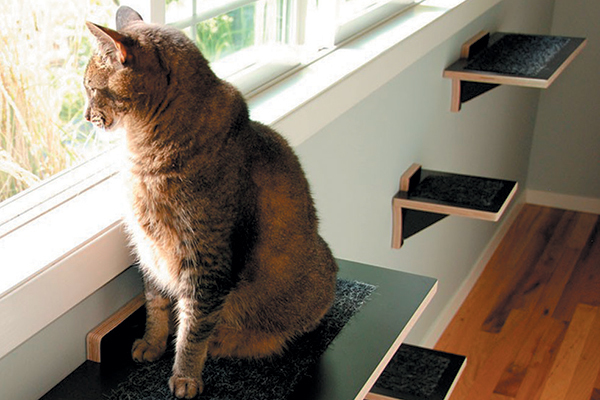 You can seamlessly integrate the design of the perches and shelves into your décor so no one would ever know that it was for a cat until they see Fluffy walking overhead. 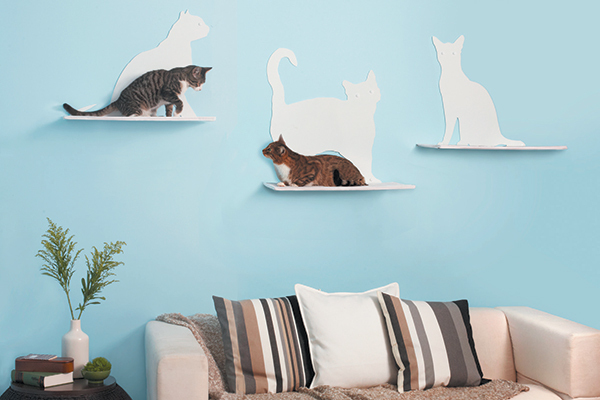 Or you could celebrate the cat shelves, making the walkway the centerpiece of your décor. When it comes to execution, you can either do it yourself or purchase items that were designed specifically for cat climbing. If you go the DIY route, use simple building materials or basic shelves from a home improvement store to build perches and walkways. Add non-slip material on the top — like carpet, sisal or a yoga mat — so kitty won’t slip and fall. If you’re not the DIY type, or if you’re short on time, there are lots of beautifully designed pre-made cat shelves available. Some have integrated scratchers or toys for added entertainment, while others come with soft cushions for lounging. There are a variety of sizes ranging from small steps to larger perches. Put perches and shelves in areas where you spend a lot of time. Photography courtesy Square Cat Habitat/Photography by Sean Hamilton. Start by moving the furniture around and clearing off existing shelves. The tops of bookcases or cabinets make great cat perches. Once you have things the way you like them, look to see if you need to add a shelf or two to connect from one surface to the next. Try to create a walkway that lets your cats easily navigate around the whole room without touching the floor. 2. Make your cat climbing system easy for your cat. Carefully plan your cat climbing shelves so they’re easy for your cat to navigate. Keep the distance between shelves from 9 to 12 inches, avoiding big gaps that could deter your cat from using the shelves that you spent so much time installing. 3. Create destinations along the way. Not all perches need to be up near the ceiling. Some cats prefer to be lower, especially seniors or those with mobility issues. Photography courtesy Catastrophic Creations. You have to give your cat a reason to use the new climbing shelves, so add “destinations.” A large sunny window with a deep ledge for bird-watching and sunbathing is a great destination, as is a cozy bed on top of the china cabinet. Make sure that the shelves lead to something worthwhile. 4. How high is too high for a cat climber? Cat climbing shelves don’t all have to be up high near the celling. Some cats prefer to be down lower, around table height. Start your climbing shelves down low, giving kitty easy access to higher spots. 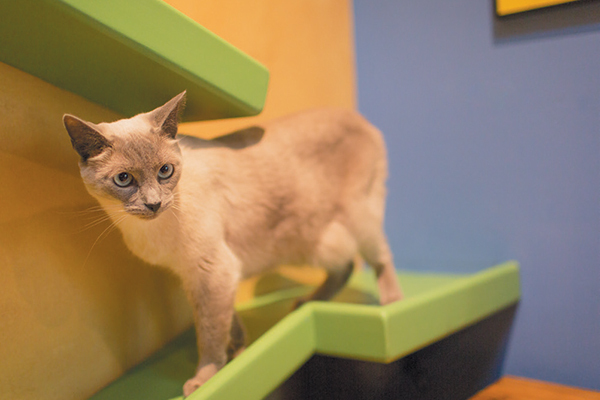 If you have senior cats or cats with mobility issues, you definitely don’t want to build too high, and you may need to add ramps or side rails to keep things safe. 5. Put your cat climber in an area that you enjoy, too. Your cat will enjoy being near you while getting a new perspective from above. Photography courtesy The Refined Feline. Add perches and shelves in areas where you spend the most time, like near your favorite chair or over your desk. Cats enjoy spending time near you, and being able to get a perspective from above is a nice option for them. Thumbnail: Photography via zenbycat.org; by © Jeff Newton.